I would love to have you join my team, the Hearts With Sass! I would love to have as you a part of my team, Hearts with Sass, and I recognize that becoming a consultant with Close To My Heart might be a big decision. Understanding that, and wondering if I would be the right up-line for you, or that my Team is the right team for you to be a part of, might be one of your concerns. So I thought I would share a little about myself, my business, and my team. Making the decision to become a consultant with Close To My Heart was a decision that I took some time to make, and yet, it has proven to be one of the best decisions that I have ever made. I love what Close To My Heart has given me, and what it has enabled me to do for myself personally, for my family, my artist within and for my career. So, to start, I am Tonya Sheridan, live in the beautiful town of Luray, Virginia that is completely surrounded by mountains. I am married to my high school sweetheart, Jay, of 15 years and together we have three children: Nicholas, age 11: my little scientist; Gabriel, age 9: who is very passionate about Polar Bears; and Abigail, age 8: who is my little ballerina princess with an a lot of sass. You will see my children are most often the subjects of my artwork. I am a Christian, and try to embed that in the way I run my business. My husband works for the World Strides, where he orchestrates international trips for music and religous groups, and is and the choir director at our church. I am a Brownie Scout Leader and taxi driver to my children. I earned my Bachelors from the Ohio State University (and this is important, as I am indeed a Buckeye) in Child and Family Studies. While there, I fell in love with the Reggio approach to education and the importance of documenting a child’s development. I participated in a Study Tour in Reggio Emilia, Italy to study this further. I have used this as the foundation of scrapbooking my children’s lives. Before children, I worked in Retail Management and enjoyed the marketing aspects of the business. Then, when my 2nd child was born, we moved to Virginia and I chose to join Close to My Heart – primarily for the discount. But after a few years, I was in love! In love with the high quality products, the variety of in-trend styles, the friends and colleagues that I have made and the company itself. I already enjoyed teaching and my Close To My Heart business allowed me to take that love to a new level. I have earned multiple National Awards with Close To My Heart, and have earned six cruises and land tours for my husband and myself. My business has allowed me to travel to conventions, corporate events, expos, and crops. And I have made amazing friends along my journey. Many of my customers have become my dearest friends; my family. My team, Hearts with Sass, is small and growing. My down-line are located around the states of Virginia, Florida, Indiana, Illinois, Delaware, Pennsylvania, Connecticut, Maryland, West Virginia and New York. I am available to them on an individual basis via e-mail, Facebook, phone, and whatever methods they need and am available at whatever level they need/want. I am not pressure some but will coach when requested. I have also established a Team Facebook Page to create a place where we can share with one another. Some of my team are hobbyist and some are business builders and really that is the beauty of this business: you can make it what you want to make it. AND, if those needs change, your business can change as well: you can be a business builder, and then become a hobbyist, or vice versa. So that is a little about me, and my business. If you have questions, I welcome your e-mail. If you are ready to join my team, click here for the application. for those who would like to become a consultant! Our new Consultant kit is just $75! Medium Organizer (Z4139, qty 1), My Acrylix® Block 2" x 6½" (Y1010, qty 1), My Acrylix® Block 1" x 3½" (Y1002, qty 1), My Acrylix® Block 2" x 2" (Y1003, qty 1), Non-stick Micro-tip Scissors (Z1836, qty 1), My Acrylix® Stamp Scrubber (Z1782, qty 1), My Acrylix® Spritz Cleaner (1778, qty 1), Bonding Memories™ Glue (1512, qty 1), 3-D Foam Tape (Z1151, qty 1), Sponge (Z697, qty 1), Customer Order Forms (W101, qty 1 pack of 25), Annual Inspirations Idea Books (WC1161, qty 5), Seasonal Expressions 2 Idea Books (WCS1163, qty 5), Cardstock Sampler (W1136, qty 1), Paper Fundamentals Sampler (W1137, qty 1), Annual Inspirations B&T Duos™ Sampler (W1138, qty 1), Seasonal Expressions 2 B&T Duos™ Sampler (W1144, qty 1), Artful Textiles—Petite Perks Stamp Set (W2034, qty 3), Gathering Invitations (W1129, qty 1 pack of 25), Desk Pad (W1140, qty 1 pack of 50), $50 Select Product Credit. Items shown represent contents of New Consultant Kits ordered between April 1, 2016 and June 30, 2016. Some items may not be shown. Contents are subject to change without notice, and change regularly based on product and collateral availability. Shipping and handling and applicable taxes apply. To sign up to become a consultant and to join my team, click here. I will also have an exclusive "happy" for you for joining my team and am running a Team Incentive Program through June 20, 2016 to reward your many successes that I am sure you will achieve! For details, feel free to contact me! I love being a Close To My Heart Consultant! It’s one of the best decisions I ever made, and I want to invite you to join my Team and get in on the fun! But before you do I’m sure you have lots of questions. Here are the answers to the most frequently asked questions. 1. Can you tell me more about yourself and your Team? Absolutely! 2. What is the cost of the New Consultant Kit, and what comes in it? The New Consultant kit costs just $75 USD plus tax and shipping, and has a retail value of $205! You receive all the essential business tools you need to get started—in a handy organizer—PLUS $50 in FREE Select Product Credit so you can choose your own creative products. It’s a great value on the tools you need, with free credit toward the fun products you want! What discount do I receive as a Consultant? Consultants receive a minimum base commission of 22%, which can increase up to 35%, depending on monthly sales totals. 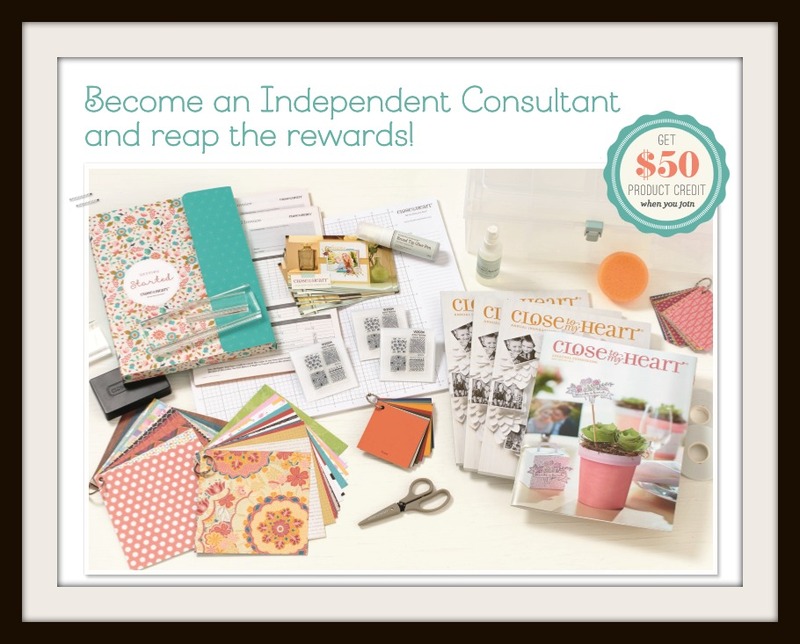 Consultants can also earn up to $75 in FREE select product credit every single month, which really adds up! When you decide to build a Team, your earning potential is even greater! This chart outlines the commission (or discount) and Select Product Credit (SPC) you receive based on monthly commissionable sales. 4. As a new Consultant, can I earn free products? Yes! You are immediately eligible for the Straight To The Top Program, with the chance to earn exclusive products in your first 90 days. There are three levels in the program, with rewards given at each level based on your personal sales. 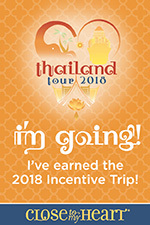 If you reach all three levels by the deadline dates, you will receive the following free products: three exclusive business builder stamp sets, an adorable “On the Go” bag, a trendy heart dangle, a Close To My Heart logo t-shirt, and a bonus for hitting all three levels which is an organizer filled with $150 in free products! 5. As a Consultant, can I have a party and be my own hostess? Absolutely! Close To My Heart has a very generous Hostess Rewards program for hostesses, and you are welcome to be your own hostess and earn even more free products! How awesome is that?! 6. What are the sales requirements for Consultants? To remain an active Consultant you must submit $300 in sales per calendar quarter. You are not required to meet the sales requirements during your first quarter; this is considered a grace period to allow you additional time to get your business up and running. The first quarter you would be required to meet the minimum sales requirements is the next quarter after you sign up. 8. Do I have to build a business? You have the opportunity to build any size of business you choose, but you don’t have to. Many Consultants buy the products at a discount for their personal use. You are welcome to simply enjoy the discount, or choose to earn income by selling to friends and family. It’s completely up to you! 9. Am I required to keep an inventory of products? No. We recommend ordering products as you and your customers need them, rather than investing lots of money up front. This means you can begin a home-based business for very little start-up cost! It’s one of the most affordable business models in the world. 10. What training is available for new Consultants? Close To My Heart offers all the training you will need! They have business videos, product videos, training courses, Start With Heart newsletters with step-by-step instructions for new Consultants, a Listening Library of recorded conference calls from industry experts, Consultant bulletin boards for artwork ideas, and more. They also offer pre-designed projects and workshops you can use to create beautiful layouts and cards. You can contact me with any questions as well! With my help, the Home Office resources, our Team’s resources, and our incredible community of Consultants, you will never be without help. 11. Does Close To My Heart offer events? Absolutely! They host a fabulous annual Convention which is full of product reveals, artwork inspiration and business training. They also offer an assortment of local events, leadership meetings, Album Retreats, and more. In addition to these incredible events, you also have the opportunity to earn our awesome annual incentive trip for you and a guest—free! 12. How much does it cost to have a website? Every Consultant is given a personal website free of charge! This is a professionally designed and maintained e-commerce site that is a terrific benefit of being a Consultant with Close To My Heart. Your friends and customers can place orders through your website 24 hours a day, and their orders will be shipped directly to their home. And the best news is that you earn commission on these orders. It’s that easy! 13. Can I accept credit card payments for orders from customers? What fees will I incur? On orders placed through your free Consultant website (called your Online Business Address, or OBA), customers can use Visa, MasterCard, or Discover to pay for their orders. There is no charge for you to accept these payment forms. Additionally, you can accept these same credit cards as payment for orders you enter through our normal Order Entry system. Again, there is absolutely no charge for you to do so! 14. How do I sign up? Go to my website to sign up. It’s quick and easy—it takes less than five minutes. Copy and paste my website address below into your internet browser. This will bring you directly to my website. Once there, select the tab that says “What We Do”, and then selection “Be a Consultant”. Once you sign up you’ll be sent your New Consultant Kit right away. Please remember that if you have previously been a CTMH Consultant, the approval process may take a few days. You will receive an email notification as soon as your application is processed. 15. Which credit cards do you accept as payment for my enrollment? 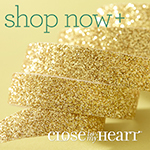 Close To My Heart accepts Visa, MasterCard and Discover. They have a secure, encrypted website to keep your private data safe. 16. How long will it take to receive my kit? New Consultant kits usually ship within 1-2 days of receiving your online application. When it ships you will receive a FedEx Tracking number so you can track your package. Want more info? This video is fantastic!